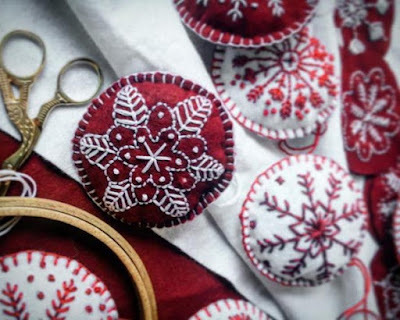 I would like to invite all you creative souls to a Christmas Embroidery Workshop. If you read that and though "I'm not a creative soul!" I say "ha! you just don't know it yet". I have been busy stitching up and designing some lovely Christmas decorations and keeping the designs deliberately easy and quick to make. If you are local to Lane Cove in Sydney I would love to see you. Do you love exquisite hand made decorations, but you think they’re too difficult to make or too expensive to buy from exclusive stores? Imagine your Christmas tree embellished with your own hand made gems that will be admired by guests and family and treasured as personal heirlooms for years to come. More meaningful, authentic and personal than any shop bought items. Many hand made things look complicated to make until you are shown how to do it in clear and simple steps. I invite you to join me in a series of workshops designed to produce quick and stunning Christmas decorations for you to keep. Workshops held at Centrehouse, Longueville Rd, Lane Cove, Sydney. Strictly only 10 spots per class. Materials provided will make 12 decorations and are included in the cost of the class. Contact Kasia via the contact page to secure your booking.